Faxness. Aww, more Faxness. Makes me want to go dance in the rain or something fuzzy like that. :). HD Wallpaper and background images in the Maximum Ride club tagged: faxness. 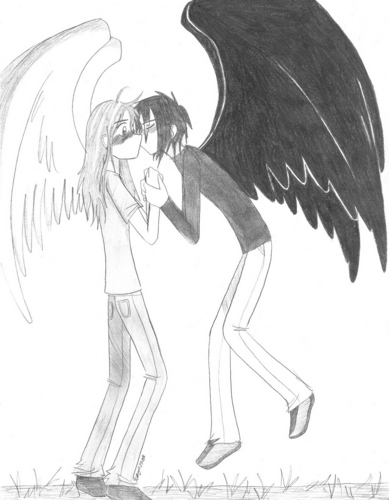 This Maximum Ride fan art might contain anime, comic book, manga, and cartoon. Geh. What is with the crappy image-res?! Go to my website to see it for reals, if you'd like. whatever, you guys, i like it. i sorta thought fang would be on the reciving end of that kiss, but it's funny how it is, i love max's expression. 1. the drawing skill is awesome, better then most fan art i've seen. 2. fang's hair is spot on n this one. in the manga books, he looks like an angry chick. 3. i so so LOVE max's expression. 4. fang is showing a bit too much enthusiasm, i think. but i'd hold my thoughts on that one, i'm on the third book and i started the series 2 days ago. 5. i have to repeat that the hair is perfect. I absolutely love this drawing, how its simple ad still stunning. Keep up the good work!